Chassis delivered to our station waiting delivery to Stainless Repair at Marshfield WI. 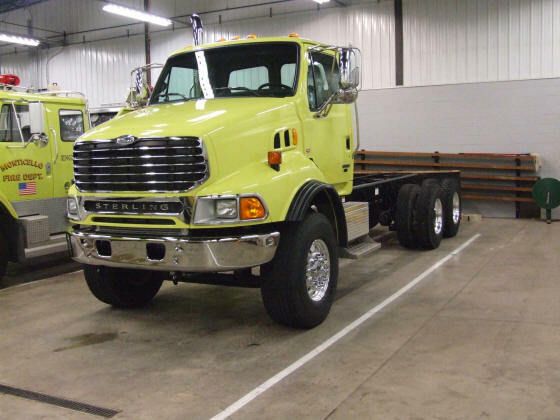 Chassis was ordered early in order to avoid a large price increase due to new emissions standards. 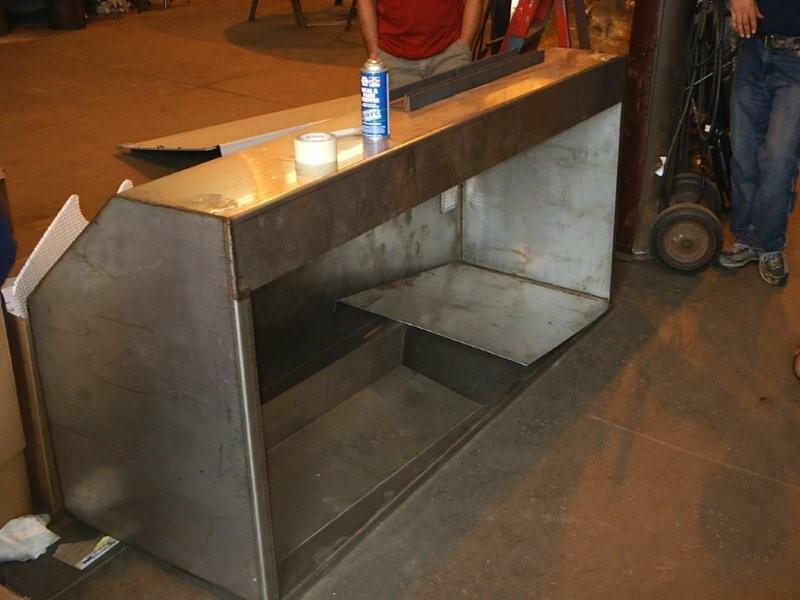 Here is the bare tank in early stages of assembly. A look at the front of the bare inner tank. In the upper left side of the front of the tank is one of the scene lights. 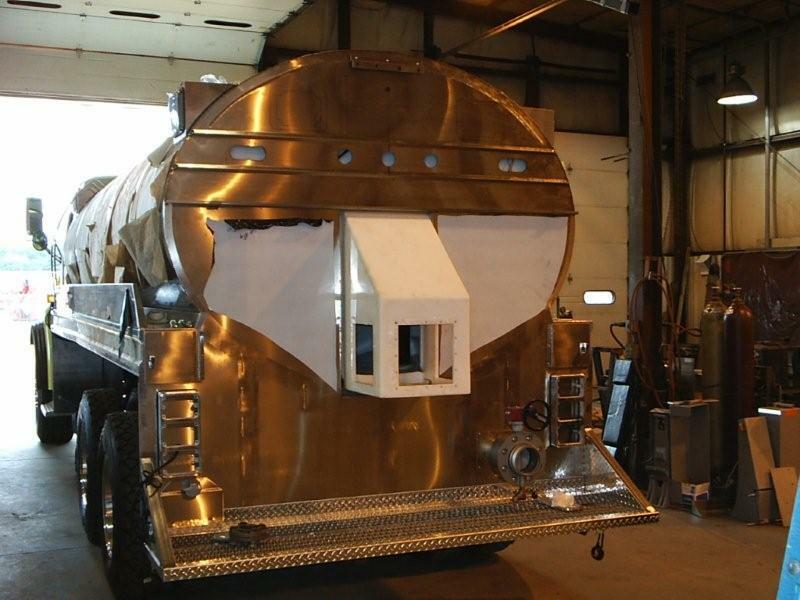 This view shows the rear of the tank with the sump for the 3 way dump valves. Also some of the wiring is attached. This shows some of the sub frame support structure that carries the load weight to the truck frame. Pump and primer mounting shown here, the large red object on the left is the pump it is a PTO type powered off truck transmission. This pump is rated at 500 GPM on the other side of the frame is the primer pump allowing the truck to fill itself by drafting from a creek or pond. Normally the truck would be filled in town from a fire hydrant as the filling time is greatly reduced. Here the rear step area is being installed also mounting for the rear truck lights. 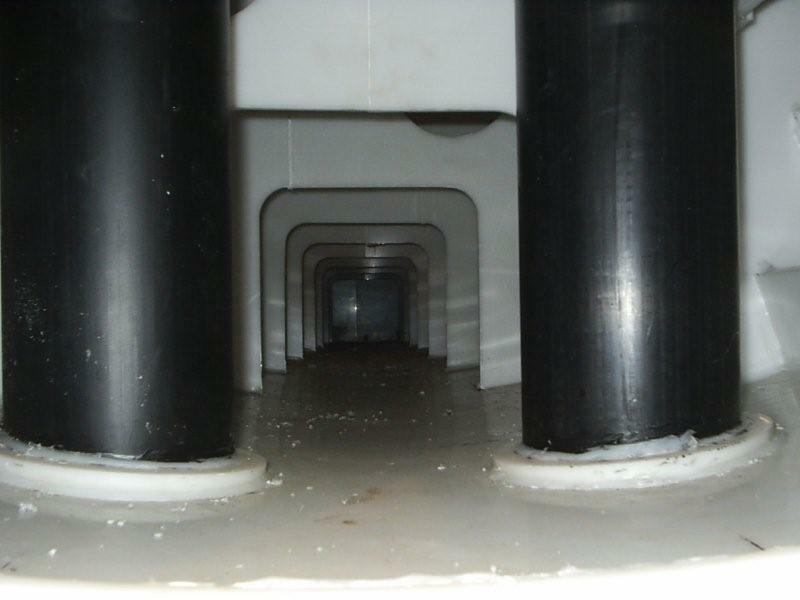 To the right the tank fill line is shown. 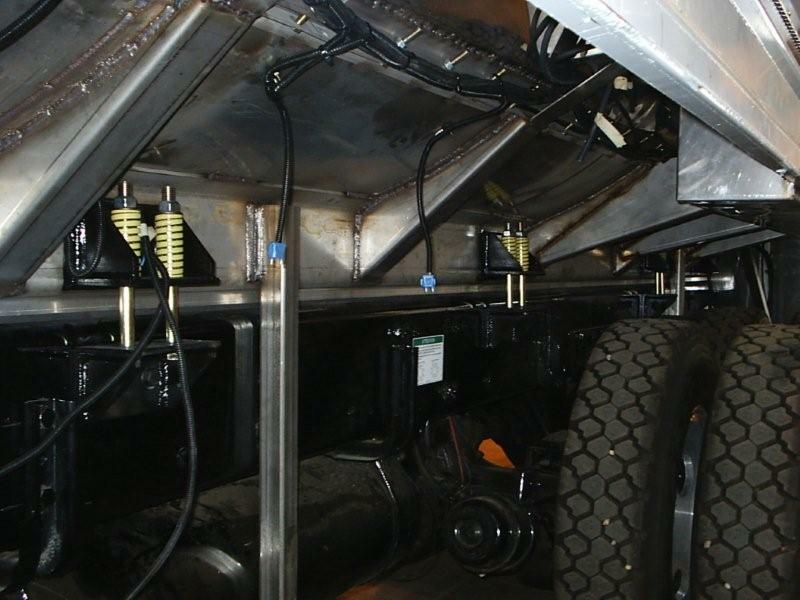 Compartments will be installed on both sides of the truck they will house the pump controls and carry all the fittings and other items for fire fighting. A look at the curb side of the tank from the front the two upright gray arms are part of the "drop-down" holders for the portable Fold-A-Tank the tank will have a 3500 Gal. capacity. Tank now mounted on the truck frame photo taken during a department inspection trip done on 04/08/2005. A cab shot the center control tower will house the radio, siren, and reference material for mutual aid calls with other departments. A look at the tank insides fire truck tanks are required to have baffles installed to reduce movement of a partial load of water on the road. The cut-out area is in line with the dump valves sump rapid discharge of a tankers water load is a must so the truck can return to the village to be refilled. Speed in loading and dumping is essential in rural fire operations. Tank to truck mounting hardware shown here the springs allow for a small amount of flex in the mounting due to flexing of the truck frame. Finished shot of the rear 3 way dump arrangement. Finished shot of the lettering on T-6. 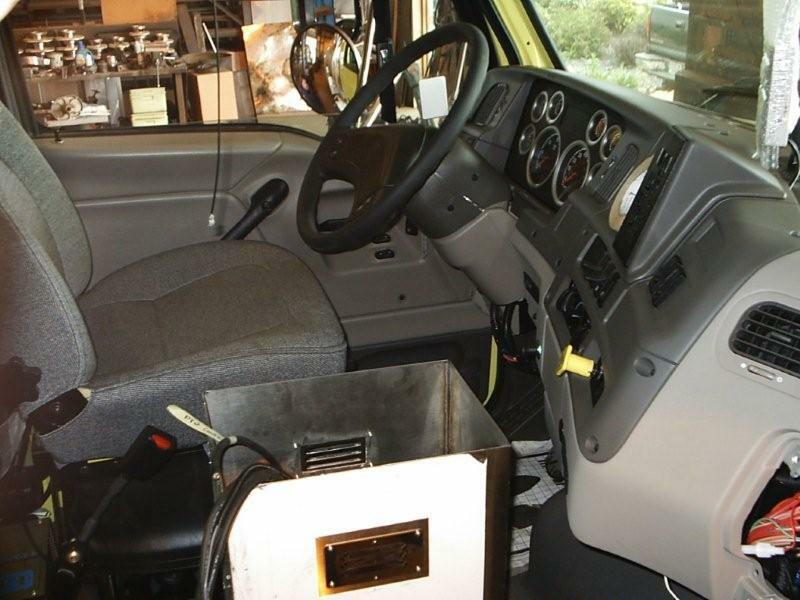 The double roll-up doors on the drivers side in the front door is the controls for the PTO pump the rear compartment has slide out "tool-boards" which have various fittings, adaptors and spanner wrenches installed. Photos of the finished truck.